Friday night crowd at El Chato. 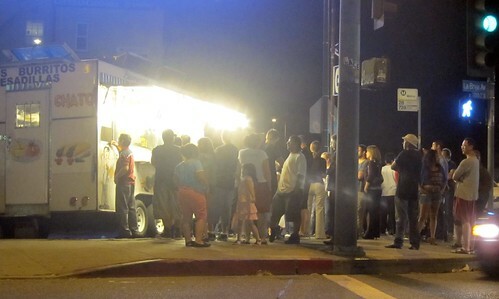 The line moves quickly at LA's most popular taco truck. El Chato has regained the top spot in the Top 20 taco truck rankings replacing Marsicos Jalisco, who held the top spot for two months. There have only been two trucks to hold the top spot but the top 5 is starting to tighten up with all five trucks within a couple decimal points of each other. Elsewhere in the top 20, Tacos Leo dropped from #7 to #10 and Kogi dropped from #18 to #20. From this point forward the rankings will be posted bi-monthly. Under each taco truck review you will see a widget to register your vote for that truck. If you’ve been to the truck register your vote.